Since we were talking about cooking, I figured that I'd dispel a few cooking myths. I know that a lot of women out there claim that they "don't know how to cook but I can boil water." For some that could be doubtful. 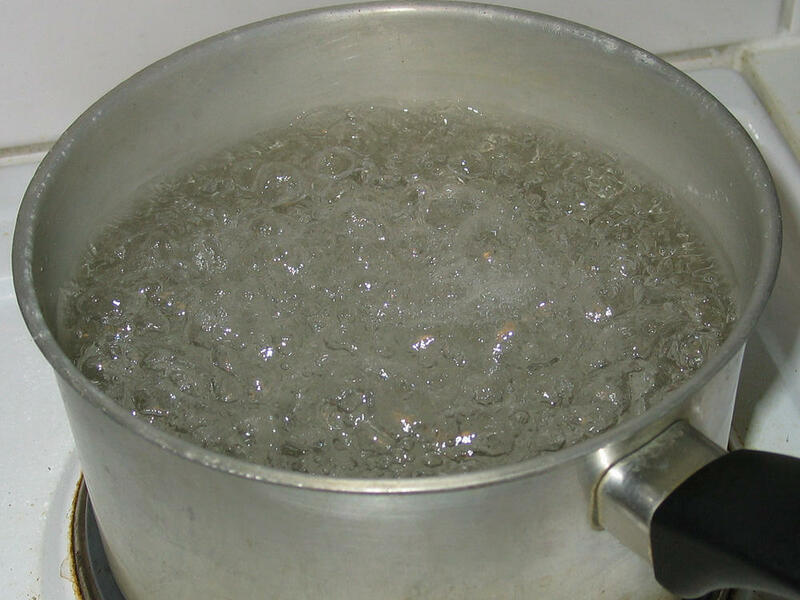 1) There is an old wives tale (or maybe it was a way to keep the women in the kitchen longer) that cold water will boil faster than hot water. I have no idea how they thought this up but changing the temperature of a liquid mass is gradual. If it's hot already... it'll get there quicker. Maybe they believe that being on the opposite end that it would gather speed exponentially... ain't happening. 2) Some people believe that you should season your water before boiling. Possibly to dissolve the salt better. But, salt has a unique attribute that it slows the temperature change in water. So much so that, if you plan to go to the beach with a cooler full of drinks... feel free to pour some salt in there with the ice. It actually will melt slower. (Just wipe the lids of the cans because that'd be gross.) When cooking, season the water when it starts to boil. 3) When making pasta, adding your oil to the boiling water before or during your noodle cooking will keep them from sticking together. This is tricky one because it is very very slightly true. Since the oil sits at the top of the water and your pasta sits at the bottom... they really don't get time to interact. When you go to drain your water, most of the oil will drain with it and most of the oil that will hit the noodles will be what clings to the pot. Most chefs toss the pasta in a little oil afterwards which will be absorbed by the noodles. If you are worried about the noodles sticking together in the pot, make sure to stir the pasta occasionally while they are cooking. My mom's boyfriend, and maybe even my mom think the opposite of the water! He thinks that if you put hot or warm water in the bottle it'll get cold faster. I just don't get it. But I just watch (stare in amusement) him put his warm water in his water bottle and put it in the 'fridge. I can cook. I just don't like to. Oh yeah, and thanks for the tips! I like the ice one. Thanks for the tips, I too like the ice one best. Hadn't thought of that. Now that Madison is fully on solid foods, I'm starting to cook new recipes a lot more. It's actually kind of fun planning out what new things to give her to try. I'm not big on reality shows... but I was watching that Hell's Kitchen.. a women on the show who actually had experience as a professional kitchen actually said on national t.v. that she thought cold water boiled faster than hot water. I never knew boling water could be so complicated. Sheesh! Cooking is my big weakness. Can't. Handle. Cooking. Feeling. Weak. Must. Leave. Blog. Immediately. When boiling water I add oil to keep the water from boiling over. An ice/water/salt mixture in a cooler will also cool down your beverages quicker than just ice or ice and water. OK, I checked this out because I had heard some similar to it as a kid, only I thought it was ice going to boiling and boiling going to ice went quicker. Something about how the molecules are closer or farther apart in both making them closer to the same state... Or something like that. Q. What about the other way around, does cold water boil faster than hot water? A. No although it may appear to get hotter quickly. The speed a liquid heats is dependent on the temperature difference between it and its immediate surroundings, including the flame that's heating it. So, because the cold water absorbs heat much quicker than the comparative hot water, initially it may appear to reach a hotter temperature very quickly. However, once the cold water reaches a certain hotter temperature the rate at which it absorbs heat slows down and so it cannot boil any quicker than the water that started out as hot and ultimately the hot water boils faster than the cold water. Mmm... My last comment got cut off. How peculiar.